I will start with Murielae (Acidanthera), which is my newest addition to my garden. 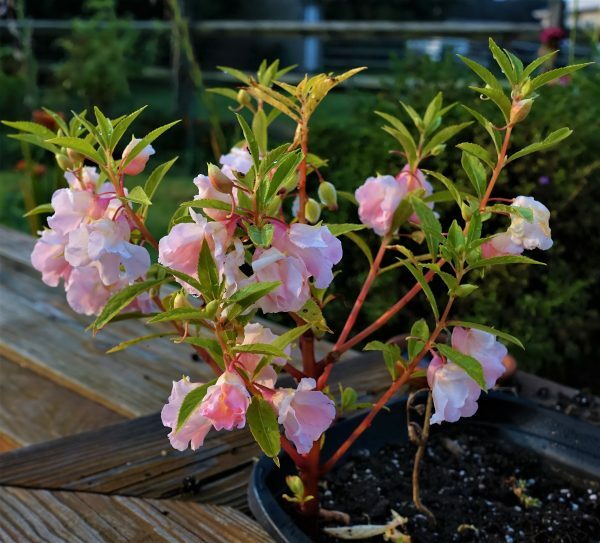 I was very excited about growing this plant, since it should bloom from Summer through Fall, and I love the color and shape of its flowers. 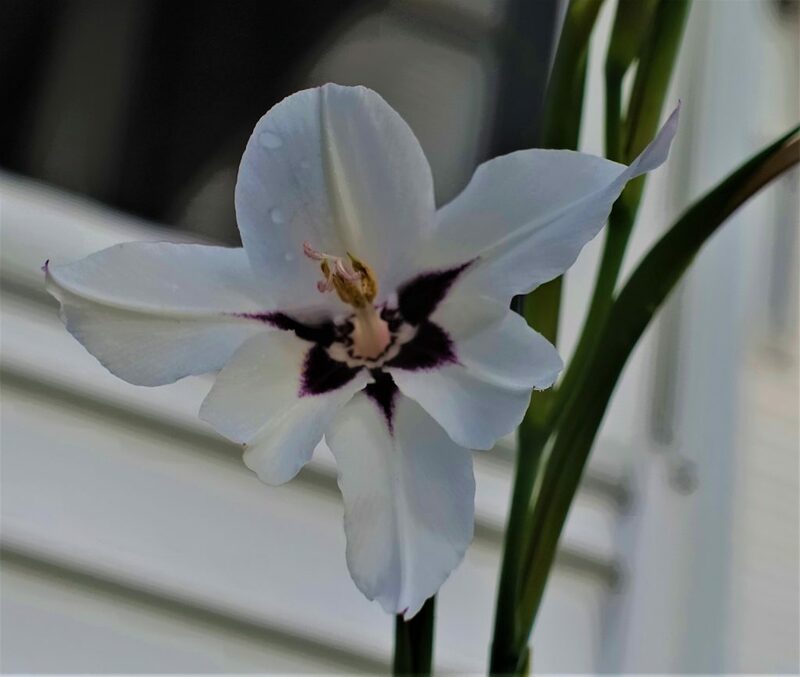 I only wish the flowers would last a little longer than they do, but because it is from the Gladiola family, the new blooms keep on coming up on the long stalk, while the previous ones are wilting away. 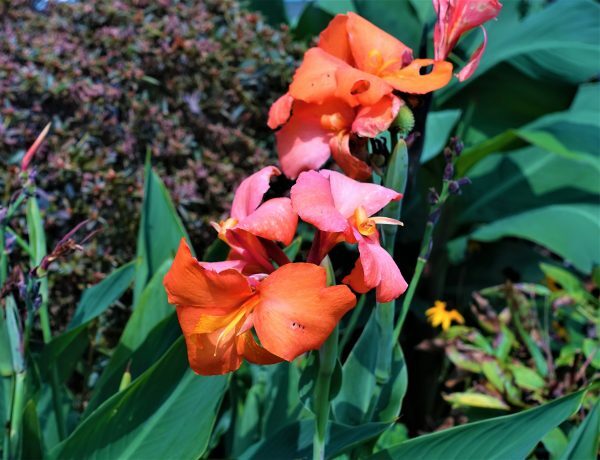 The plant is about 36 inches tall, so it is planted in the back of my flower patch, along side of the Red Canna Lily. I am also very pleased to have this Encore Azalea in my garden this year, as it blooms again in late Summer, besides the usual Azalea blooming season in Spring. As you can see it has only few flowers this year….it is still trying to establish itself in its new location…but I am sure next year it will be filled with gorgeous blooms. It also is very special to me, since it was a Mother’s Day gift from my daughter. 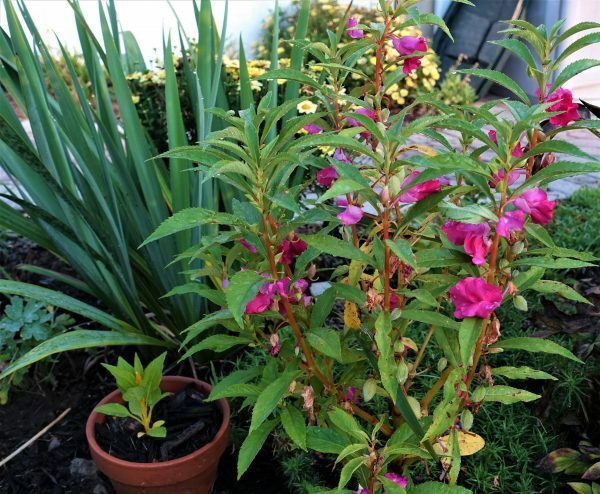 Here is a set of three different colors of Impatiens Balsamina, which is an annual plant, but reseeds itself so easily…too easily…so the following year I have free plants in my garden. I love the way it matures to a bushy looking plant, filled with blooms throughout the bush. 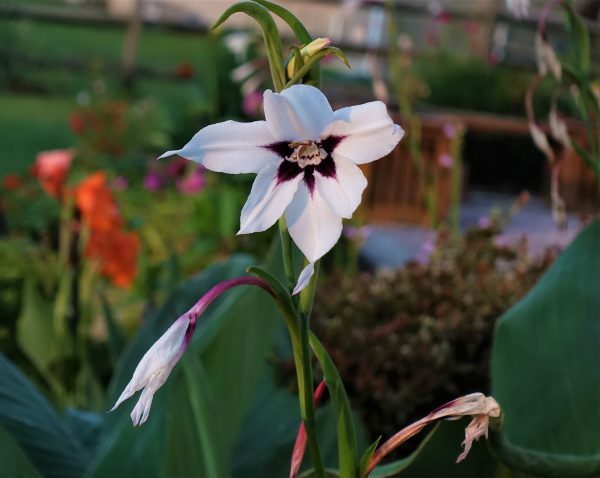 These plants also hold a special place in my heart, as the seeds came from my sister, who lives in Eastern Europe, even though this plant is actually native to southern Asia, India, Srilanka, Bangladesh, rather than Europe. Every time I am around these plants, I reminisce about the times I shared with my sister. Beautiful dwarf pink Dahlia is another favorite flower of mine, as this was my mother’s favorite flower in her garden. 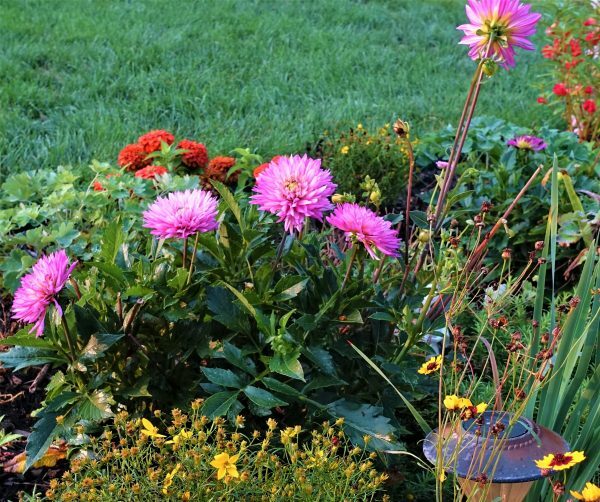 She did not have the dwarf variety, but she would make sure she had the latest colors out there, and some of her Dahlia flowers were more than 12 inches in diameter. Dahlias bloom from Summer to Fall, but the bulbs (tubers) need to be dug up and stored indoors for the winter, in most zones, including mine. The tubers also need to be dug up and stored indoors for the Winter season, and replanted in the Spring….at least in our zone. 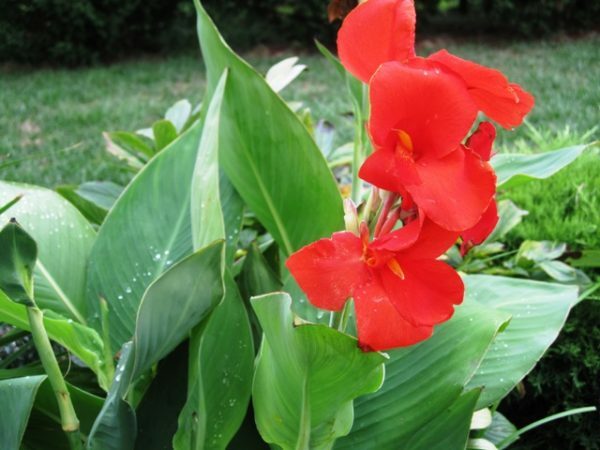 This is the tall red Canna Lily from my husband’s aunt. These are gorgeous as well, with luscious large leaves, and the mature plant can reach up to 5 feet in height. It makes a wonderful background plant in my garden, but it does require a lot of space to flourish, while the dwarf type grows to about 24 inches in height, and its leaves are half the size of the red one. 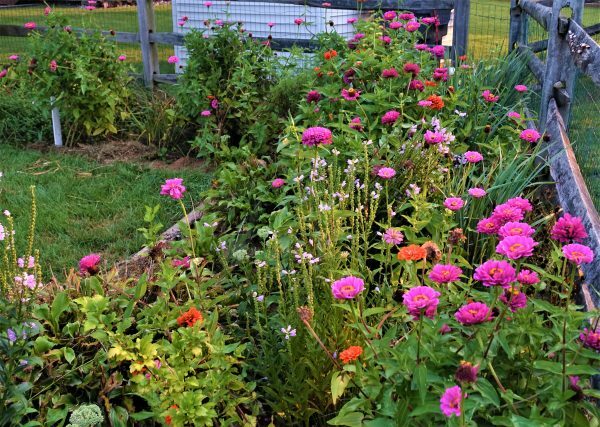 These are one of my favorite flowers….dwarf Zinnia, in pink and orange. I love the way they stay compact, yet branch out and fill up with numerous blooms. I will be collecting their seeds at the end of the season, to grown my own seedlings next Spring. This year I was successful with only two of these bushes, so hopefully next year I will have more luck. 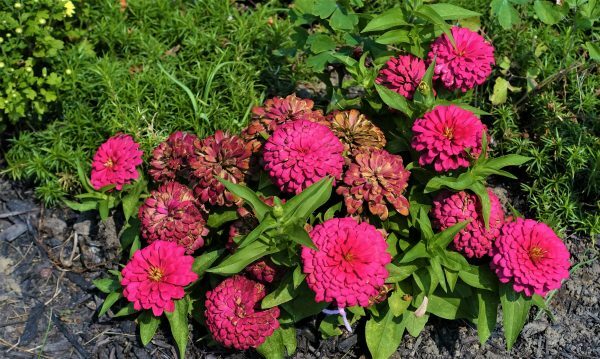 Zinnia plants are annuals, but as the flowers dry up, I collect seeds to plant in Spring, as they normally do not reseed themselves easily. 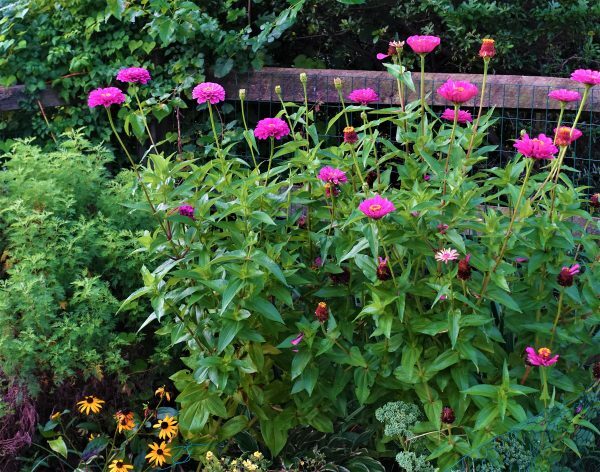 These are my very tall Zinnia flowers, which usually need extra support to hold them up, as they can easily reach close to 4 feet in height. This is why most of them grow in my “wild flower” garden patch, next to a fence, where they get the needed support. Even though they are quite “leggy”, they make wonderful cut flowers to use in bouquets. I am on a lookout for other colors to add to my collection. Here is another plant that can get quite tall…about 3 feet…and quite bushy. This is a Purple Dome Aster. 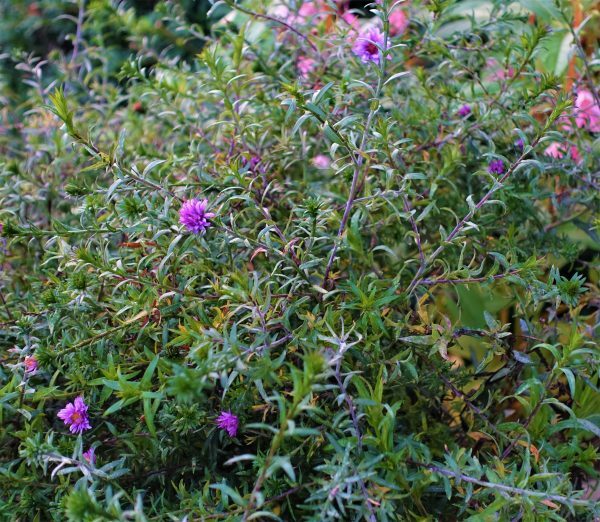 It is a perennial, which starts growing in early Spring, but does not bloom until mid August. As you can see it just begins to bloom, but in few days it will be filled with these tiny, daisy like, purple flowers with yellow centers. It is a showstopper once in a full bloom. I tried cutting it down in mid May to stifle its growth, but it did not really affect it much. This is a previous year picture of the Purple Dome Aster in almost full bloom; to show you how the whole plant fills up with vibrant tiny light purple flowers. I believe these also come with light pink and deep blue flowers as well. This is my wild flower, Baby Sun Coreopsis, which grew from seeds I picked up at a Botanic Garden in Washington DC about 10 years ago. 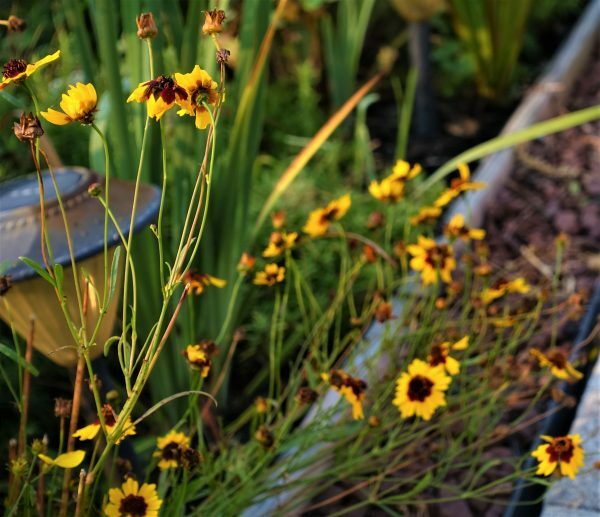 Some Coreopsis plants are perennial, but this one is not, however it reseeds itself from mature seeds which drop into the ground, and sprout in Spring. This year I will try to collect some of its seeds so I can share with others, and seed them where I want them, rather than wherever they come up on their own. 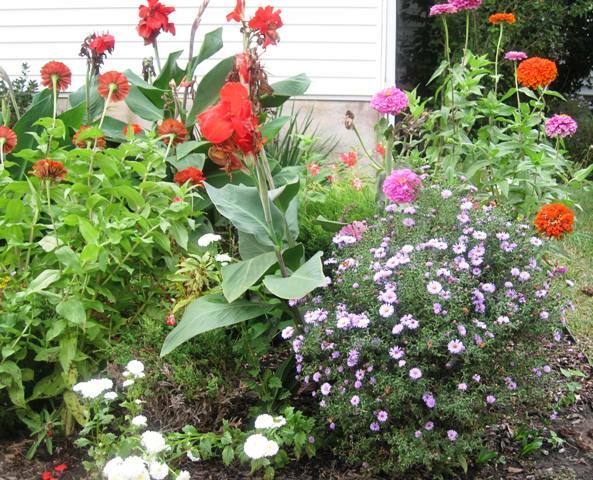 These flowers add so much happy color to my late Summer garden. The stems are quite flimsy to be able to support the weight of the flowers, so they easily fall over without additional support. Last year I planted this Scabiosa, also known as Pincushion Flower, and this year I spit it into 3 separate plants, to space them more symmetrically in my garden. 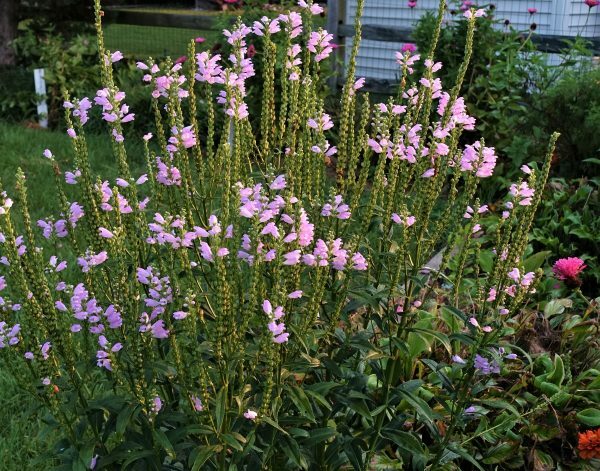 It is a perennial plant which does not require much maintenance. 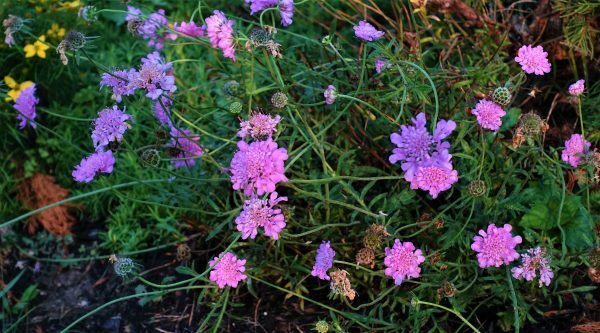 It blooms from late Spring through Fall, as long as you deadhead the dried up blooms. 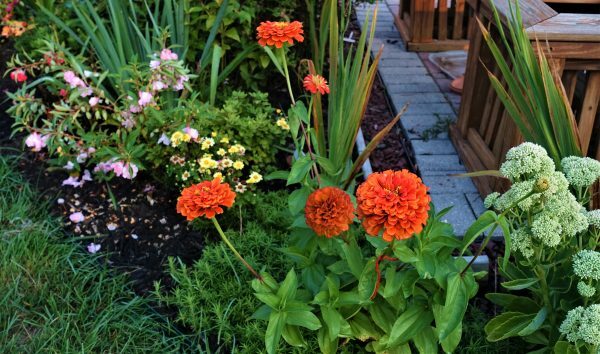 It grows low, so it’s great for edging and borders. 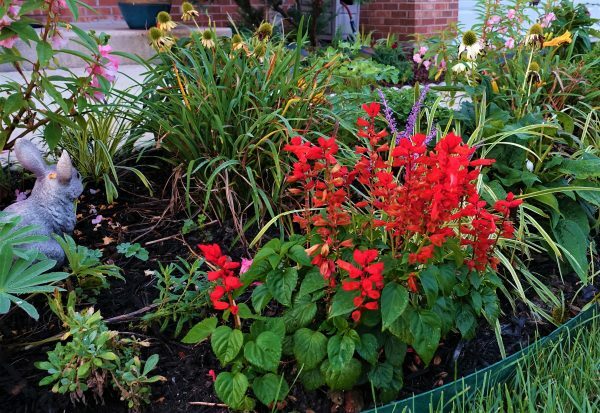 This Scarlet Red Salvia was a surprise to me this year. I did plant some last year, but did not expect to reseed themselves and pop up this year…but I love the surprise. 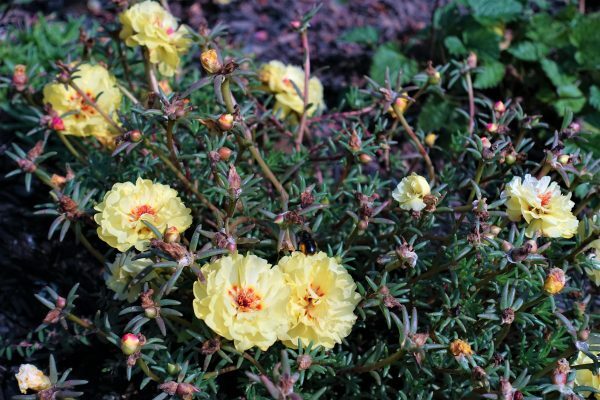 Here is another “surprise” plant in my garden this year…..Portulaca, which also reseeded itself from last year. I knew about its ability to reseed from prior years, but did not recall having it in this spot last year…hmmmm….but I am not complaining. This year I will collect seeds and make sure I have more of them next year. This succulent looking plant is very heat resistant, hence so easy to take care of. 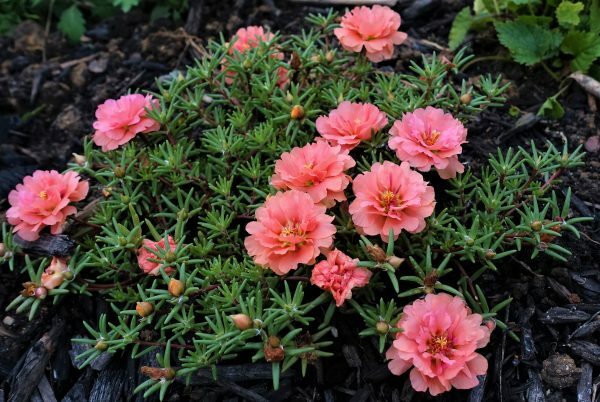 Also, it is kind of a mysterious plant, because it fully opens up its blooms in full sun, and closes them into small buds late afternoon, once they are out of the direct sunlight. 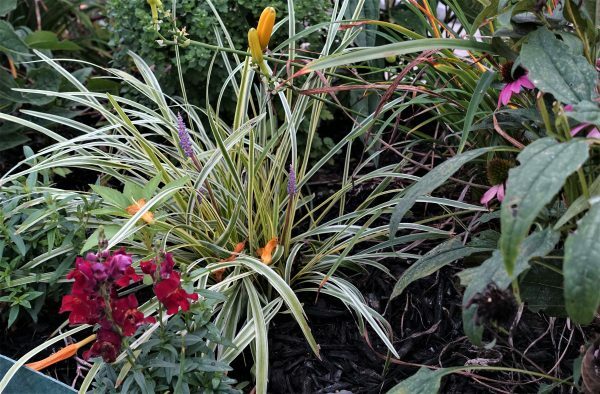 I love the lemon yellow and the salmon color of these two plants, but I would like to get other colors as well. 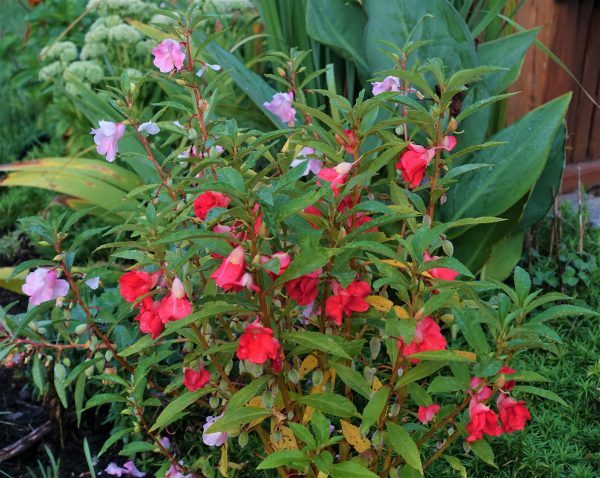 Snapdragon plants are an annual, however they reseed themselves so well, that if you let them drop their seeds, next year you will have a blanket of new plants to transplant to your favorite spots. Actually, in my zone (7), some of the old plants survive the Winter and start new growth the next Spring. However, that process is unpredictable since it does not turn out that way all the time, so I don’t count on it, so I collect their seeds for next year’s seedlings. 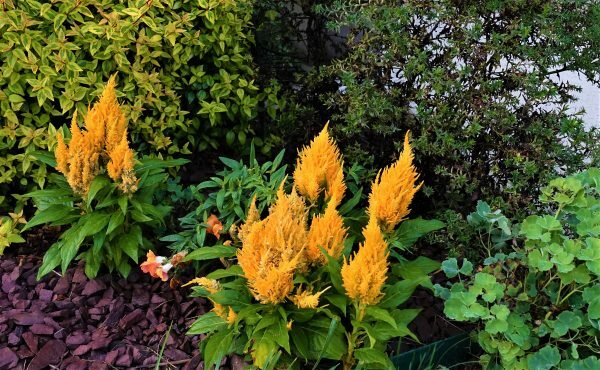 This interesting plant, Yellow Celosia, also came up on its own from previous year. I am not sure if it grew from seeds or roots…. I believe it must be from seeds, as this plant is an annual in my zone. I love its yellow plumes, being different from other plants I have, and it is only about 9 inches tall. 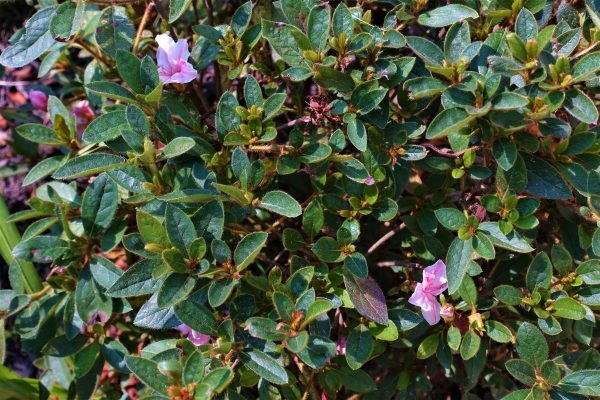 It starts growing in late Spring, and blooms from mid Summer until frost. Pink Sedum is a great plant in any garden. 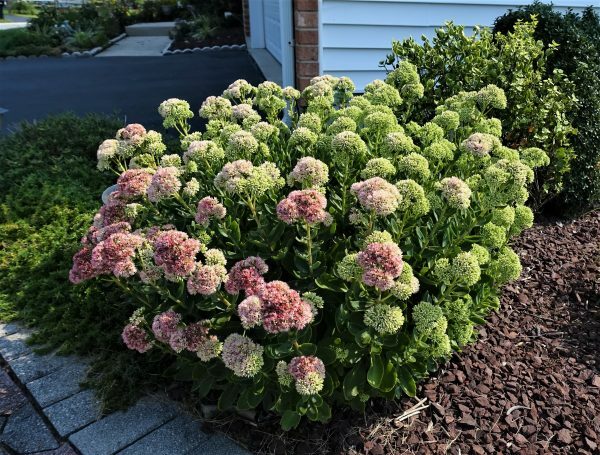 It is a perennial plant, with green succulent looking leaves until mid summer, then it forms clusters of green buds, which eventually begin to open up to pink blooms ( in this case), then the flowers keep getting darker until frost, at which time they turn light brown and dry up, and stay that way until Spring. 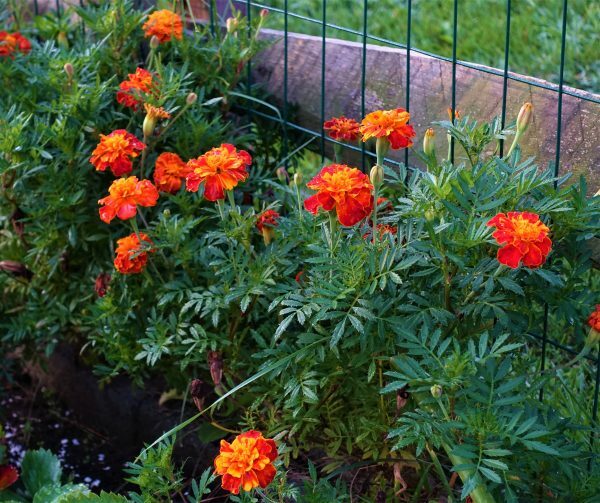 Last, but not least, is the infamous vibrant Marigold plant. These are the dwarf type, so I usually use them in borders, but this year I planted them on the perimeter of my vegetable garden, to deter pests and bugs from being attracted to my veggies. 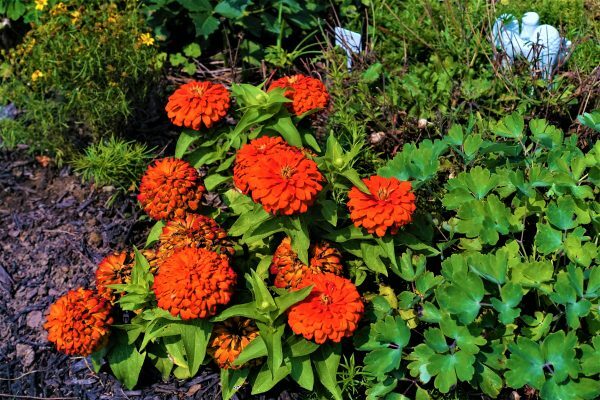 The Marigold flowers and plants are very showy, but they are not favorably fragrant, hence some gardeners do not include them in their flower beds. They really thrive during the cooler Fall months and continue to bloom until frost. They normally do not reseed themselves easily, so I collect their seeds and use them for planting in Spring. 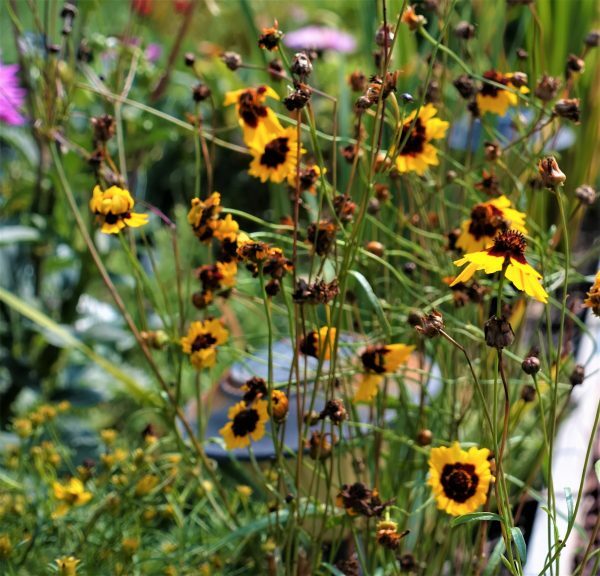 You can also pull off the dry seed pods in Fall, break them up and throw them around into your garden, and some of them will sprout next Spring on their own. I hope you had the patience to read this post in its entirety, and checked out the links provided, to learn more about the plants you found interesting.